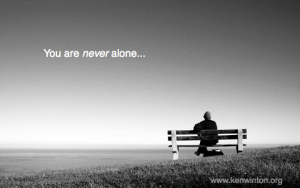 There are times when we feel utterly alone in the world. One such time sticks in my mind: It was the Winter of 1987, Sharon & I had just moved to Greenville, SC, leaving our home, our families, our jobs and any other earthly security we had, so that I could pursue ministry training. We found a nice apartment in Greenville, I started classes — now all I lacked was a job to pay our bills! But a month after our move, I had yet to find that job and we had come to the end of our financial resources. I remember one day in particular when it all seemed to hit me — I felt so utterly alone. I was about to learn an important lesson about God’s faithfulness. In II Timothy 4:16, Paul described a time in his life — far more serious than the one I just described: He was standing trial for his faith in Jesus Christ. Sadly, no one stood with him — in fact, everyone had forsaken (abandoned) him! He was all alone. Well, not really. He sensed the Lord’s presence. Paul knew his Lord stood with him, and was as the same time strengthening him, so much so that at his trial Paul had the courage & boldness to preach the Gospel to all in attendance (vs. 17)! At the end of this same verse, Paul also seems to indicated that he was delivered from a guilty verdict as well (guilt of the Faith, yet innocent of any crime). This passage is a powerful reminder that in Christ we are never utterly alone. While we may not be able to see Him, our Lord is standing with us through whatever it is we are facing, giving us the very strength we need to journey on and bring Him glory. Whatever it is you are facing, be reminded that the Lord has never left your side. So, back to 1987… Not long after that day, God came through with a job in a very unlikely way. Our money never did run out. We were never really alone.